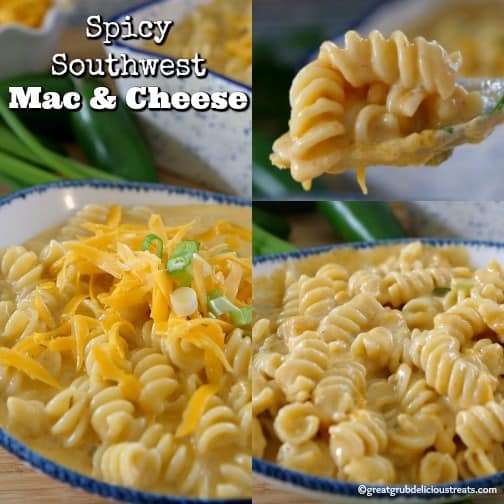 Creamy and a tad bit spicy, this spicy southwest mac and cheese is definitely some delicious tasting comfort food. This macaroni and cheese recipe is so good especially when a craving for some good ol’ comfort food hits. 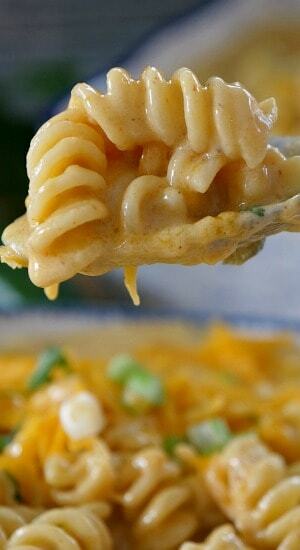 Macaroni and cheese is a family favorite around here and this spicy southwest mac and cheese is to die for. So creamy, so satisfying and a delicious side dish to add to the dinner menu. 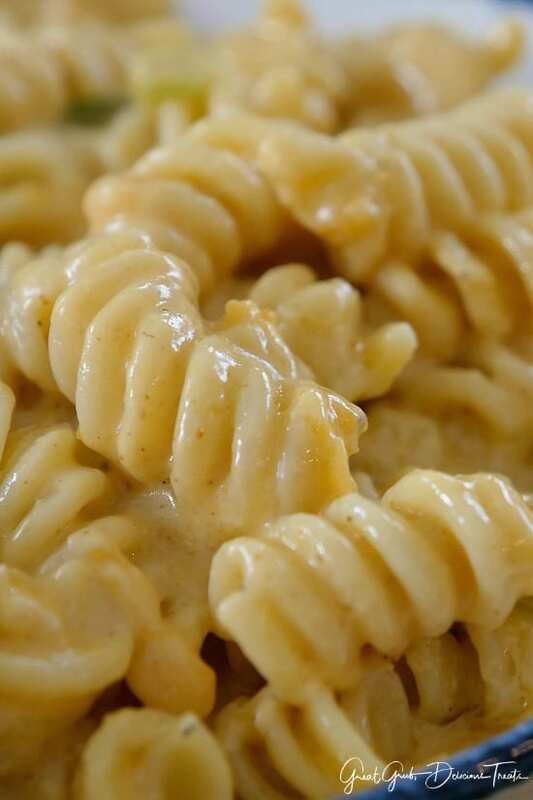 This easy mac and cheese recipe is a quick meal that can be on the table in 30 minutes. When time is limited, this is a convenient recipe to whip up that is both filling and satisfying. The Southwest dip can be purchased at the grocery chain, H.E.B. here in Texas. If you are not able to shop at this amazing grocery store, you can use 8-9 ounces of Creamy Southwestern Ranch dip from Tostitos®. 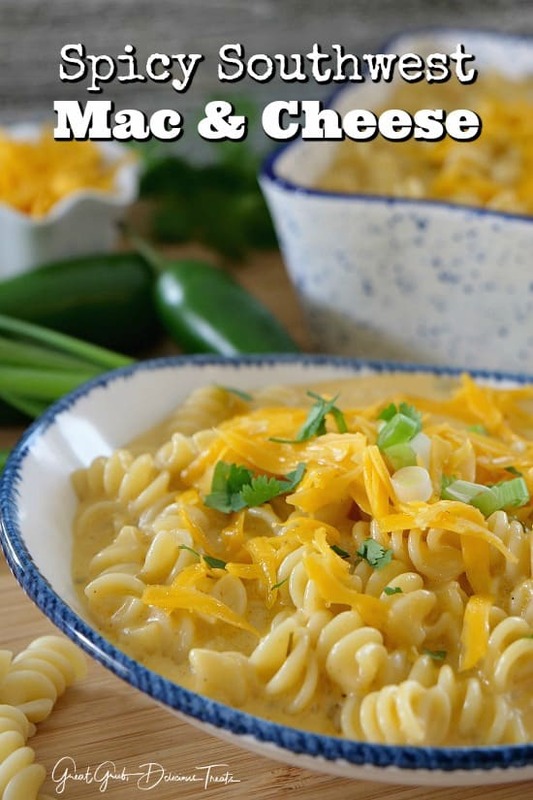 I know this recipe is limited to those who can get their hands on this southwest dip from H.E.B., but if not, try the other one mentioned for a delicious tasting mac and cheese. Since moving to Texas, going to H.E.B. weekly is something we look forward to. Who likes to grocery shop?? We definitely love it when H.E.B. is our store. We have met some incredible people and Lisa, the manager of the culinary section, always welcomes us by name, gives us samples of the recipes she has made and is always willing to answer questions and gives helpful information to her customers. H.E.B. is the best grocery store I have ever shopped at! Plus, they are always helping the community as well. Every time we see Lisa we joke that I’ll be changing up one of the recipes we sampled and will be putting it on the blog. 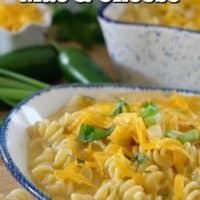 The southwest mac & cheese is one that I knew I had to share. The only thing I did differently was to add jalapeños making it a spicy mac and cheese. And for the garnish I added sharp cheddar, green onions and cilantro. Thank you Lisa for another wonderful recipe I could change a bit and share with all my readers. Here are a few more delicious comfort foods that can be found on the blog: Spicy Chicken Pasta and Gravy, Easy Beef Goulash, Chicken Fried Steak Fingers, Hamburger Hash Brown Casserole, and Cheesy Garlic Scalloped Potatoes, plus many more delicious recipes. 9.9 oz jar Robert's Reserve® Southwest Dip, bought at H.E.B. While pasta is cooking, using a large saucepan, bring heavy cream and southwest dip to a boil. 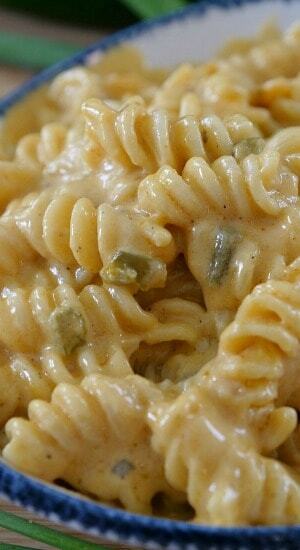 As soon as it starts to boil, add Velveeta and jalapeños to milk mixture, stir until melted. 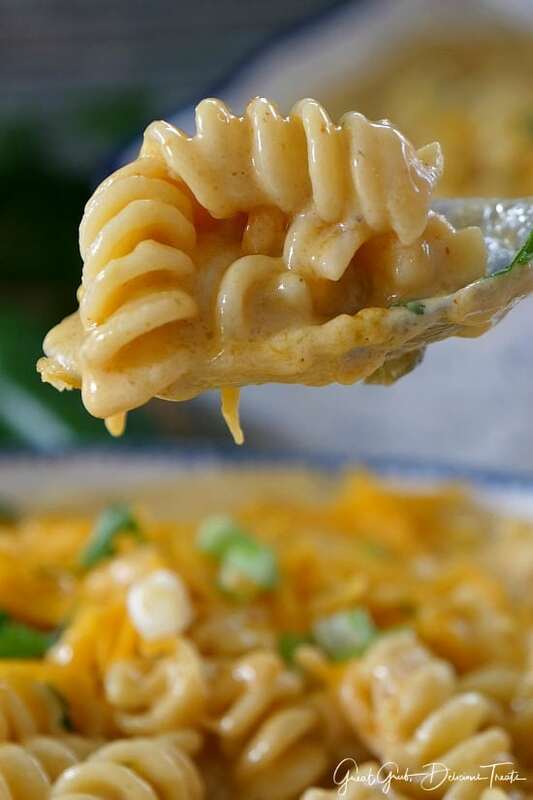 Spoon pasta into cheese mixture, stir and spoon into serving bowls. Top with grated cheese, green onions and cilantro. Enjoy! Recipe adapted from Lisa, our friend, at H.E.B and the Cooking Connection. This is absolutely a must try. 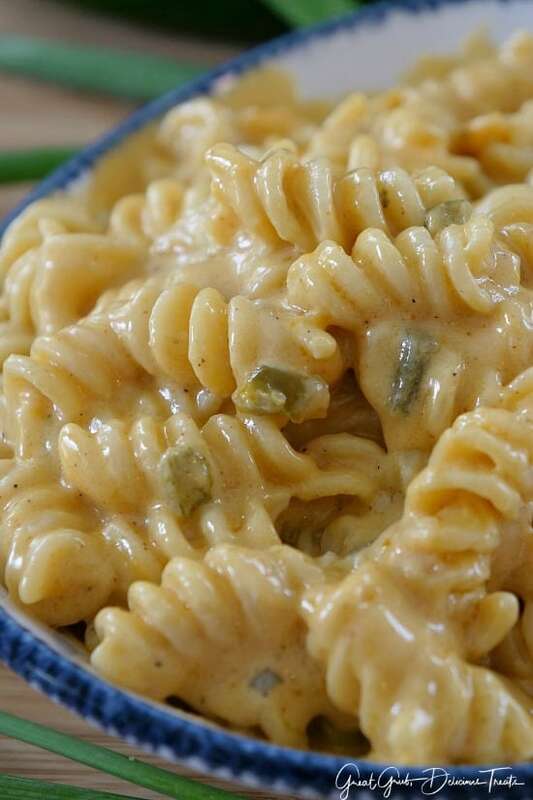 Love all the ingredients: Pasta, cheese, peas and all with a southwestern flare.